Women Working for Oceans, in partnership with the renowned New England Aquarium, works to inform individuals about the challenges facing our ocean inspiring them to take action to ensure a healthy, sustainable blue planet for tomorrow. W2O creates opportunities for its members to engage in action at all levels; community, state and federal, engaging legislators and advocating for change. Your voice matters. Thank you for your encouragement, spirit and support! We all want to protect what we love. We depend on the ocean for our food, economic security and even the oxygen we breathe. The ocean is the heart of our planet. “Now is the time to act to save our oceans,” says Barbara Burgess in W2O’s OUR STORY video. Our journey together is just beginning! Onward! Founder and Chair of W2O, Barbara Burgess’ deep admiration for everything “Ocean” began early while racing small boats on lakes in the Midwest. With her Dad she sailed the magical islands of Maine and her ocean passion grew deeper. After attending the Williams College Mystic Seaport Maritime Studies Program she graduated fr om the University of Vermont with a BS in Education and Environmental Studies. From working as a deckhand onboard a schooner to teaching for both Mystic Seaport Maritime Museum and Mystic Marinelife Aquarium her determination to educate people about the sea continues to evolve. As a trustee of Bigelow Laboratory for Ocean Sciences and the New England Aquarium, she juggles protecting the oceans with raising five children with her husband, Bill, in Weston, MA. W2O co-founder and New England Aquarium Board Chair, Donna Hazard grew up in California, where she spent as much time as possible in or near the Pacific. Her first snorkeling experience on Catalina Island opened her eyes to the magic of the underwater world and turned into a lifelong passion for the ocean. Donna studied biology at Princeton University, earned an MBA at Harvard, and is completing a Masters in Sustainability at Harvard’s Extension School. “For the first half of my life I considered the ocean invincible. Then I realized that humanity is having a profound impact on ocean health. W2O and the New England Aquarium are my year-round link to the sea and my best opportunity to help protect it. They inspire me, connect me to the ocean community, and empower me to advocate for better conservation policies and practices.” Donna spent her career in the biotech industry and management consulting before becoming involved in non-profits and raising four children with her husband, Chip. For nearly her entire life Priscilla Brooks has been fascinated by the ocean and the wildlife that call it home as well as the people and businesses that make their living on and from sea. Priscilla is CLF’s Vice President and Director of Ocean Conservation, focusing on protecting New England’s ocean wildlife and habitat and ensuring sustainable use of ocean resources. Before joining CLF in 1994, she conducted extensive research on seafood marketing and trade, as well as aquaculture economics. In addition, she has worked on recreational fishing boats and research vessels in waters from Labrador to the Caribbean. Priscilla holds a BS from Cornell University as well as an MS and PhD in environmental and resource economics from the University of Rhode Island. She is lucky enough to live along the magnificent Great Marsh north of Boston with her husband and two kids. An active hiker and outdoor person, Dianne Matukaitis Brown grew up landlocked in southern Ohio. She spent her childhood outdoors playing in the brook at the bottom of her garden – digging for clay and chasing the fish and crawdads that lived under the rocks. Her contact with the ocean was limited to family vacations in California or by the sea in England. Once there, the ocean transported her to a magical planet of amazing light, sound and smells. Prior to joining the board of W2O, Dianne worked in banking, served as Treasurer on several boards, and was active as a Girl Scout leader and Community Food Pantry volunteer. She loves swimming, diving, body surfing, ocean kayaking and paddle boarding. Her spirit animal is a dolphin. She lives with her family in Sudbury, and spends countless summer hours enjoying Narragansett Bay and her husband’s home town of Jamestown, RI. Dianne holds a BA in History with a minor in Economics from Wellesley College, and an MBA in Social Entrepreneurship from Babson’s Olin School of Business. She currently serves as Director of Finance for W2O and is a member of the Executive Committee. Sheila Burkus is a graduate of Cornell’s School of Hotel Administration and a passionate foodie. As a cooking and nutrition instructor, she is committed to educating people on the importance of sustainable farming and fishing practices. She believes that food choice greatly affects the well-being of our population while directly impacting climate change and the health of our environment. Sheila, her husband Greg and their four children have spent the last twenty years enjoying the beaches and water in Chatham, MA. This has created a deep desire to protect and improve the condition of our oceans and sea life. Her involvement with W2O aligns well with the organizations mission to inspire through education. Sheila is currently W2O’s Director of Membership and Outreach. Linda is a visual artist who credits a lifetime of sailing for her love of the ocean. She founded and directs Bow Seat Ocean Awareness Programs to inspire and support the next generation of ocean caretakers. Bow Seat was born from a personal feeling of responsibility for our planet. It grew out of a deep concern for the health and future of our oceans and a desire to help protect our seas. Linda believes in the power of art, prose and film to raise awareness. Bow Seat programs recognize and celebrate student art and it’s ability to effect positive social change around the globe. Linda enjoys seeing the student’s creativity and ingenuity expressed in entries that are submitted to the program. Art can become an important catalyst to spur student curiosity, dialog, awareness and action. Along with W20, Linda is also a trustee of the New England Aquarium and Isabella Stuart Gardener Museum. Devoted to educational reform, she values quality education for all children and serves on the boards of the Neighborhood House Charter School and Horizons at Dedham Country Day School, a summer enrichment program for underserved youth. Working in financial services for 20 years, Mary now finds herself back at her roots, as a geologist and nature lover turned environmental activist. A fortuitous turn happened the summer of 2014 when she volunteered at The Nature Conservancy on Block Island. She did whatever was needed to help out. Shellfish propagation and field work on the Great Salt Pond are her favorite activities. Mary volunteers at the New England Aquarium as a water quality technician and a volunteer scuba diver. Through the Aquarium she takes college classes as part of Boston’s Marine Science Consortium. While conducting research interviews for a paper in Biology of Whales class, she became fascinated by entanglement as well as mass strandings of whales. She sponsored Sonic Sea, a documentary about ocean noise pollution and how we can mitigate its devastating effects. After graduating from Skidmore College, Mary went to work in Manhattan and met her husband. The couple moved to Boston and Mary completed her Masters of Business Administration in Finance from Boston University and went to work at Cerulli Associates, Inc. They have three grown daughters and a dog. Growing up in the Berkshires and spending childhood summers vacationing on the coasts of Maine and Cape Cod turned Pat Chory into a lifelong lover of and active participant in the outdoors, with countless hours spent skiing, swimming and hiking. The New England Aquarium and the passion of the women of W2O have inspired Pat to learn more and she has become active in the important work of promoting ocean conservation and protection. Pat changed her own habits years ago in order to make better choices regarding what to eat, what products to use, what cars to drive etc. to help protect our ocean and planet for the generations that follow us. After graduating from Fairfield University with a degree in writing and communications, Pat went on to study business at Boston College and worked in the commercial insurance industry. She has three adult children and lives in Weston with her husband John and two cute dogs. Pat serves on W2O’s Board as Membership co-chair. Emily Conklin is a marine scientist and educator. She is a graduate of Wheaton College MA and the Three Seas Program with Northeastern University. Throughout her Master’s in Marine Biology, Emily focused her research on the societal understanding and implications of marine environmental problems and climate change. This research introduced her to Women Working for Oceans, where she now serves as a Board Member and Social Media Manager. Her goal as a scientist and in her role for W2O communications is to share information in a productive way that empowers others to take action. Her work with W2O is fueled by an underlying love of the ocean and belief that understanding an issue is the first step towards solving it. Ellen Curren of Winchester grew up watching the ships navigate Port of Providence from her backyard in Cranston, RI, and sailing on Narragansett Bay. After a career in NYC working as a Theatre Film and Television Agent, she lived on the coast of The Bass Strait in Australia and was inspired by that nation’s commitment to ocean stewardship. Last year, she joined the media/communications team for the Boston Women’s March and worked logistics on the day as the crowd swelled to 170 thousand participants. Recently she has joined the media team on the March for the Ocean scheduled for June 9th in Washington D.C.
A lifelong ocean lover, she is concerned about the global impact of pollution, overfishing, and especially climate change on our ocean’s health. Ellen curates and contributes to the W2O blog and serves on the W2O Board of Directors. Katie Fagan grew up on the coast of Maine, sailing on Casco Bay and fishing in remote Maine ponds, so joining W20 to bring awareness about the threats facing these beloved areas was a natural decision for her. She has been an Overseer at the New England Aquarium for the past six years and has been inspired by the Aquarium’s valuable worldwide ocean conservation work. She joined the W20 board in 2014 and kicked off her involvement by co-chairing the “Heroes of the Oceans” celebration, an event recognizing the many communities in Massachusetts that enacted plastic bag and or polystyrene bans. Since moving to Boston, she’s become actively engaged with other local environmental groups, advocating for strong legislation that will further W2O’s mission of protecting our oceans. Shawna Giggey spent her summers on Rehoboth Beach in Delaware. She collected horseshoe crab shells that were plentiful along the beach. She was captivated by the treasures and peacefulness of the ocean. Shawna was drawn to the healing power of science and became a pediatric oncology nurse. She learned about W2O when a member recognized her commitment to recycling and reusing. Shawna loves that W2O works to heal the ocean and reduce the plastic pollution that threatens its beauty. Since joining the New England Aquarium in 2014 as President and CEO, Dr. Nigella Hillgarth has been working to raise the profile of the Aquarium’s global conservation and research work. Born in rural Ireland and educated at Oxford University, Nigella arrived at the Aquarium after serving 12 years as Executive Director of the Birch Aquarium at UC San Diego – part of the world renowned Scripps Institute of Oceanography. Prior to her work at the Birch Aquarium, she served as Executive Director of the Tracy Aviary in Salt Lake City, the largest bird park in the country, where she collaborated on research programs on penguins in South America, as well as conservation efforts for marine birds in the Galapagos, Peru and Argentina. A distinguished biologist, Nigella has conducted research expeditions all over the world including Britain, India, Thailand, Antarctica, and the Amazon. Mary Alice’s passion for protecting our oceans is rooted in her many summers spent living on Cape Cod. Watching her three boys thrive as they navigated and explored the inlets and shoreline near their home, Mary Alice came to see an important connection between the health of our future generations and the health of our oceans. This connection has inspired her dedication to learning more about preserving, promoting, and protecting our oceans. On Valentine’s Day 2011, Mary Alice attended the inaugural meeting for Women Working for Oceans, a gathering of women who are passionate about their love for the blue planet. Her involvement with the W2O has continued and she looks forward to increasing her own conservation knowledge so that she may foster a sense of guardianship for the oceans in her friends and family. Mary Alice, a graduate of Ohio Sate University with a degree in communications and advertising, lends her experience from an extensive past in publishing, producing and creating successful magazine publications across the U.S. and her current work as an Overseer at the New England Aquarium. As a teenager, Susie spent many days on her brothers’ boat in Maine where they taught her to sail and love the marine life she experienced. She studied art in California and received a Bachelor in Fine Arts from the California College of Arts & Crafts. Now she owns a glass studio in Cambridge and Martha’s Vineyard where the ocean inspires many aspects of her creations. She works to protect their natural habitat and advocates for the ocean’s survival. Susie and her husband Andy own Almost Perfect Glass in Cambridge and Martha’s Vineyard Glass where you can see how her love for the ocean inspires her glass creatures. Kathleen McQuiggen was introduced to W2O at the Women’s March in Boston in 2017, where W2O was highlighted for its involvement. As a longtime advocate for investing in women and a lover of oceans, she thought W2O was a match made in heaven and got involved with the W2O’s Membership Committee. She is a financial planner and wealth advisor at Artemis Financial Advisors where she is focused on helping women create a sustainable financial plan and investment portfolio. She is Special Adviser on Gender Diversity to the Center for Financial Planning at the CFP Board, and lives in Boston and Dartmouth, MA. Kathleen served as moderator for W2O’s Investing for Impact Event. Anne Peacher is a lifelong ocean lover, mother of three, community volunteer, swimmer and explorer of natural beauty in Boston and beyond. She and her husband Steve are longtime supporters of the New England Aquarium. Anne remembers pushing all three of her kids in strollers around the Giant Ocean Tank. Years later, one of her teenagers had the chance to scuba dive in the Great Ocean Tank as part of an Aquarium education program. Anne views W2O as a natural extension of the Aquarium to help spread the word on how to protect our oceans. W2O’s programming taught her the importance of reducing plastic waste, driving fuel efficient cars, and lowering energy use. Anne has worked to eliminate her town’s schools of single use plastics. She just earned her Master’s degree in Organizational and Professional Communication at Regis College, she joins W2O’s board of directors and wants to put those skills to use with educational programs and social action. A graduate of Tufts University and former news producer at Boston’s Channel 4, Anne has lived in the Boston area for more than 30 years. Liz Richardson has always been an activist; first advocating for patients’ rights as a clinical speech pathologist and then as a Healthcare Quality Management Administrator. Since moving to Newton in 1991, where she currently lives with her husband and raised three sons, Liz has dedicated her time to public education advocacy and running local political campaigns. The ocean and marine life have always been of special importance to her family. She grew up near the New Jersey shore and has been working to preserve the ocean and conservation land in Nantucket. Joining the W2O Board was a perfect way for her to continue increasing public awareness and involvement, both essential to the future of our environment. 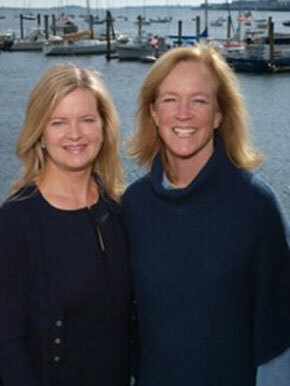 Her husband Duncan is also a NEAQ Board Overseer making ocean and environmental preservation a family priority. Laura Parker Roerden is the Executive Director and Founder of Ocean Matters, a nonprofit that brings young people to endangered marine eco-systems for service learning projects. Her love for the ocean dates back to her earliest memories of playing in the waves on the beaches of Rhode Island and later as a scuba diver immersed in a more “heads under” look at the sea. She began her career in marine education over twenty years ago by volunteering at the New England Aquarium’s whale watch and has since taught marine science in a myriad of settings including traditional classrooms, on decks of science-at-sea programs, and on scuba 100-feet beneath the sea. Laura has a master of education degree from Harvard University and a B.A. from Boston College and is a lecturer and author of books, curricula and articles on young people’s social, emotional, and ethical development. She has designed educational outreach projects for the Corporation for Public Broadcasting, the National Basketball Association, Pokemon USA, Olympians at Athletes for Character Education, Ben & Jerry’s Ice Cream, AT&T, Operation Respect, as well as for various film, music and video projects. She is the former publisher and managing editor at Educators for Social Responsibility and former managing editor of the magazine New Designs for Youth Development. Laura also currently serves on the board of directors of Earth, Ltd. of Southwicks Zoo and believes that today’s young people are a reason to be hopeful about the many problems facing our oceans. Laura serves on the Executive Committee of W2O and is a frequent blog contributor. Born and raised in California, Heather spent her childhood looking for crabs and sea stars in British Columbia and visiting national parks in the western states. After college, she taught marine science on both coasts. Graduate school brought her to Boston and then to the New England Aquarium. Working at the New England Aquarium for almost twenty years, Heather was responsible for overseeing all programs and staff for the Conservation Department including strategic growth and fundraising as VP of Conservation. She led the Aquarium’s sustainable seafood programs and acted as a senior sustainability advisor in all corporate partnerships. She was also the senior director of the Phoenix Islands Protected Area initiative, Marine Conservation Action Fund, international scientific expeditions and policy initiatives and the World of Water (WOW) conservation film series. Heather has a Master’s degree in International Relations and Resource and Environmental Management from Boston University and a Bachelor’s in Environmental Studies from University of California at Santa Barbara. She currently serves on the Advisory Board of the Marine Conservation Action Fund and Green Newton.